Why are Perfume Cans and Other Aerosols Considered Harmful To The Environment? 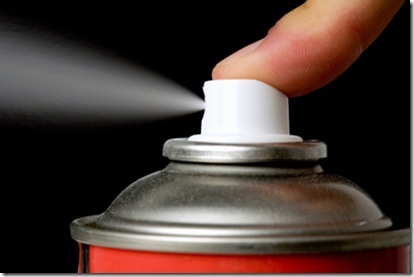 We all use aerosol dispensers in many ways in our life-right from the can of the perfume to paint sprays, insect repellants etc. They all contain compressed fluids, which are contained in high pressure and can be pointed and sprayed to release the gas inside. However, to create such an effect within a can, the mixture inside the can also contains harmful CFC’s (Chlorofluorocarbons) which are a major cause of the ozone layer depletion and air pollution. These CFC’s are used as propellants inside the can as they help in directing the mixture inside to come out as a thrust of a gas spray. When these CFC’s are released in the air, they slowly start moving up the atmosphere and get concentrated. This is when they are affected by the electro-magnetic radiation of the sun causing them to release chlorine ions in the atmosphere. This chlorine reacts with the ozone resent in the atmosphere and slowly starts displacing the free ozone molecules. As we all know, the ozone layer protects us from harmful rays of the sun, without which the normal sun light we see would also have contained a higher proportion of harmful radiation that would have a damaging effects of us as well as a the eco-system. World-over, CFC’s are widely used in pressure cans to help dispense the product as a sprays, with the perfume industry being one of the major users of this technology. There has been a recent awareness on this trend that has resulted in a gradual shift from such usage. However, as with any other form of pollution, the decrease in the cause is not evenly spread out, and there is still a rampant usage of such technology. Instead of aerosol dispenser, we can use a pressure pump, or a fluid form of the product as and when possible. Major perfume brands have been moving away from such harmful chemicals and are using other alternative propellants in perfumes. We also see a gradual increase in pressure pumps to dispel larger amounts of fluid such as insecticides, agricultural sprays etc. Not only do CFC’s damage the ozone layer, but this unwanted additions also cause health hazards in some people with sensitive allergies. So, before you find a spray can handy, think in a broader perspective, and take a wise decision.